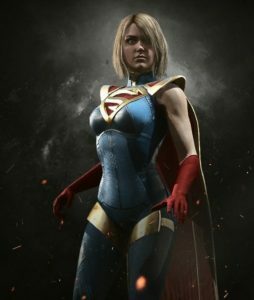 This page contains a character guide for Supergirl in Injustice 2. Here you’ll find movelists, combos, juggles and strategy guides and recommended gear for the Hero character. For more Injustice 2 content, head over to our Injustice 2 top page. Kara Zor-El is the cousin of Superman. She lived in the city of Argo with her parents when Brainiac attacked. Her parents, Zor-El and Allura had no choice but to send Kara into a ship to Earth that was on the same course as Superman’s. However, her rocket was struck by a meteor so she arrived years after her cousin. She crashed into the Gotham City Bay before being discovered and brought to the surface by Batman. When she reunited with Superman she remained hidden in the Fortress of Solitude for her own safety but was later moved to Themyscira and trained by Wonder Woman and her Amazons to help her better control her powers. Meter Burn R2 (must press R2 in the middle of Rising Sun Strike). Supergirl can perform eye laser attacks while on the ground. must have full Character Power. Supergirl can perform eye laser attacks while airborne. Below are combo and juggle inputs for Supergirl , including corner strategies and restarts.